Description: The Bell Wreath is an easy Macrame project, suitable for older children and beginners. 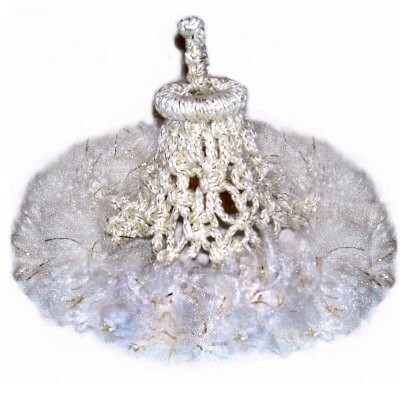 This holiday decoration features a bell shaped area in the center, with a brushed fringe as the wreath. A small metal bell is added on the inside, to give this unique wreath a musical jingle. 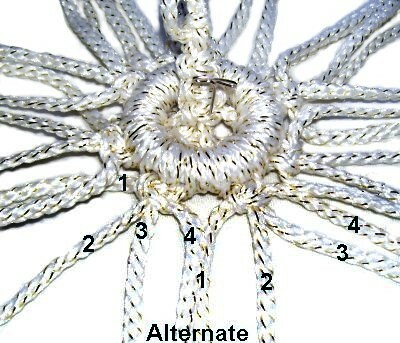 Only basic knots are used for this wreath ornament, and the arrangement can be changed if you want to experiment. 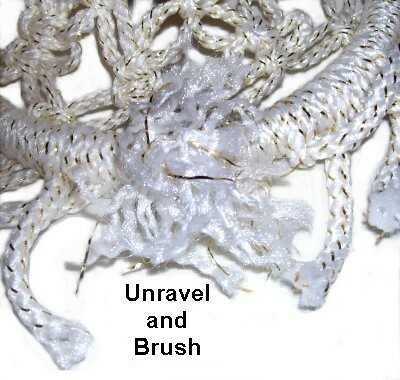 You can make this decoration with any type of material, but make sure it can be unraveled and brushed easily. In the example shown, the decoration is 4 inches from the top ring to the one at the bottom. You can change the size by using smaller or larger rings, and make adjustments to the height. You'll need to change the number of cords and their length, if you alter the size (see Preparation). I used thick plastic rings in the example, but metal ones work just as well. The material used in the example is polypropylene, with metallic threads. 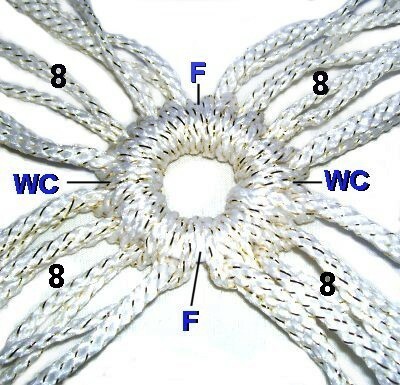 There is no need to prepare the ends, if using braided cord. 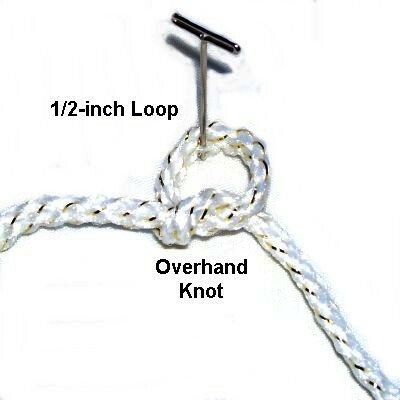 For twist style cord, tie Overhand knots at the tips. Design Tip: For changes to the ring size of the Bell Wreath, cut the 45-inch cords as you mount them to the small ring. This way you will cut only the amount that can fit on the ring. If you want to increase the height of the bell design, cut the cords longer. 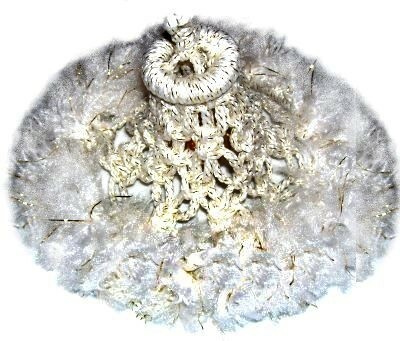 Step 1: There is a knotted design used as a hanger, at the top of the Bell Wreath. It is used to hold the small bell as well. You can find another way to hang the decoration and attach the bell, if you prefer to change this portion. 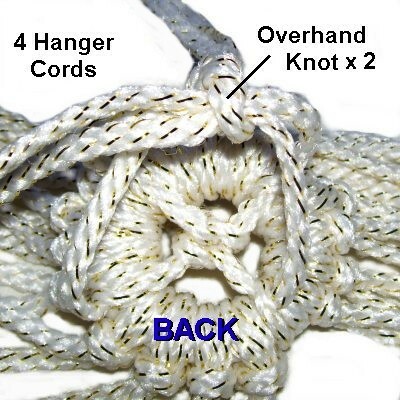 << Fold one of the 30-inch cords in half, and tie an Overhand knot. Leave a 1/2-inch loop. 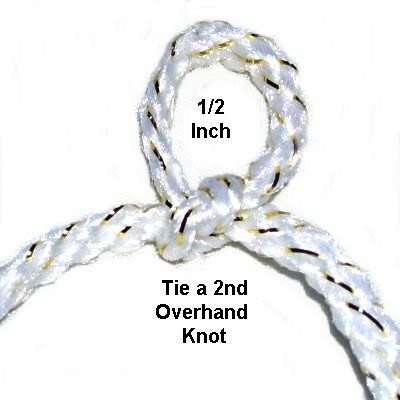 Now you will make a Square Knot while adding the second 30-inch cord to the first. Fold the new cord in half and secure it under the ends of the first cord. 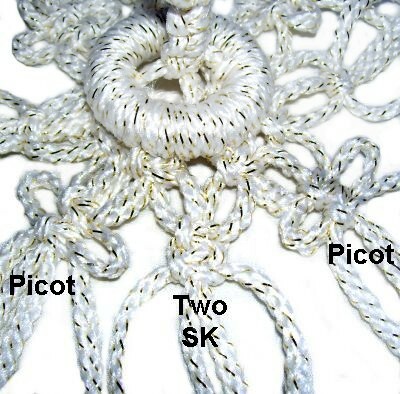 The two ends of the new cord are used to tie the SK. The two from the loop are the fillers. << Direct the left half of the new cord to the right, over the fillers and under the right half of the cord. The two ends of the working cord have switched places. 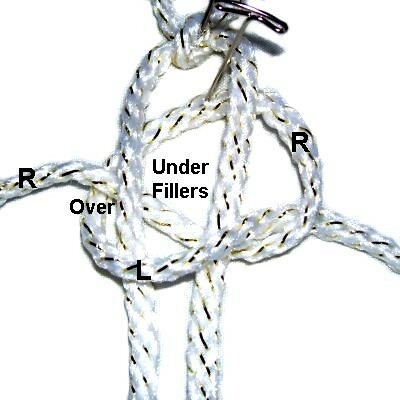 << Move the left half of the new cord to the left, over the fillers and under the right half. 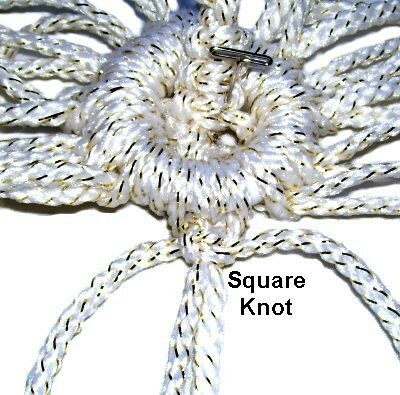 Tie 2 more Square Knots following the same 4 steps. Step 2: Put the hanger design aside for now. 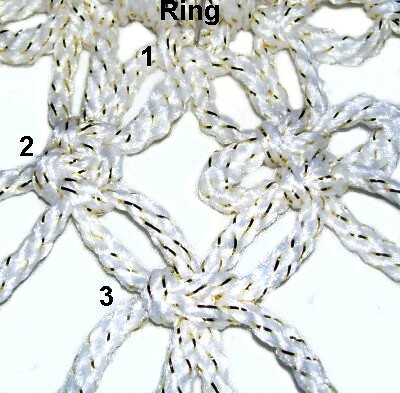 << Fold one cord in half, and place it under the bottom portion of the 2-inch ring, as shown. Attach the remaining 45-inch cords to the ring the same way. Arrange the cords into 4 groups of 8. The four groups should form and X shape. 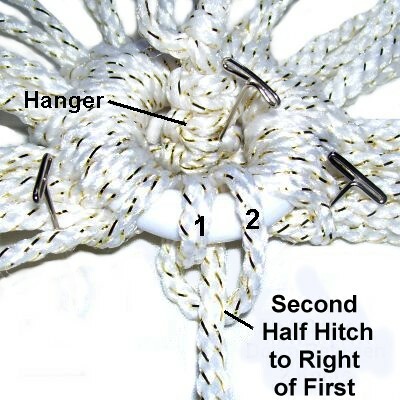 To attach the hanger, the fillers (F) will be attached to the top and bottom of the ring, between the groups of cords. The working cords (WC) will be attached on each side. Place the hanger inside the ring. Secure it so it cannot move. Arrange the four cords as in the image above, placing them under the ring. Secure them as well. Slide the long cords to the sides, in the area you will be working. Use pins to hold them out of the way for now. 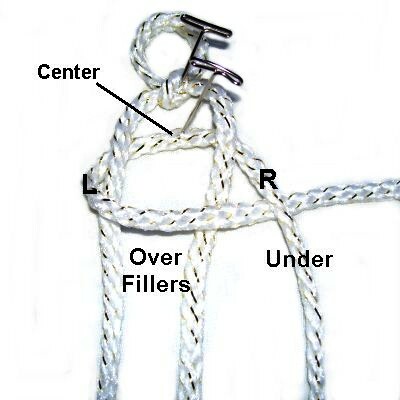 << Use the cord in the front (filler), passing it over - under the ring. As you pull it straight down, bring it over the cord. Tighten firmly. Attach the remaining cords for the hanger in the same way. Design Tip: When you attach the cords to the large ring at the bottom of the Bell Wreath, you will use Double Half Hitches again. Turn over the ring, so you are working in the back of it. Locate the four hanger cords, which are shorter than the others. 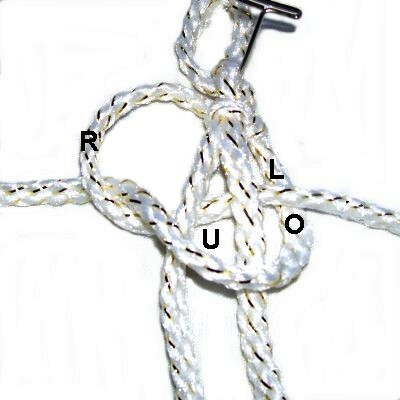 Use two cords on the right and left to tie 2 Overhand knots, as you did at the top of the hanger. Apply glue and cut off the excess material when it's dry. Design Tip: The small bell is attached where the knot is located, in step 8 of the Bell Wreath design. Do not attach it now, because it will get in the way. You will need to use a piece of wire or fine cord to attach the bell, since they usually have small holes. 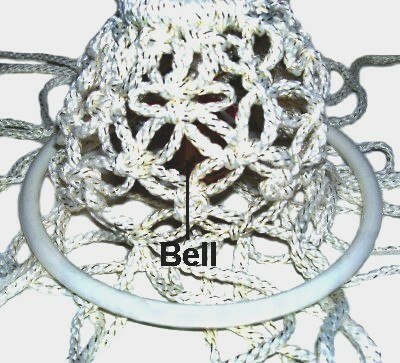 The main area of the Bell Wreath is made with alternating rows of Square Knots. I added Picots to some of them, to make the design more interesting. Step 3: Tie the first row of Square knots, using groups of four cords. Each knot will have two working cords and two fillers. While tightening, pull on the fillers slightly, so that the SK will rest against the knots on the ring. Step 4: Mentally number the cords from two knots resting next to each other. 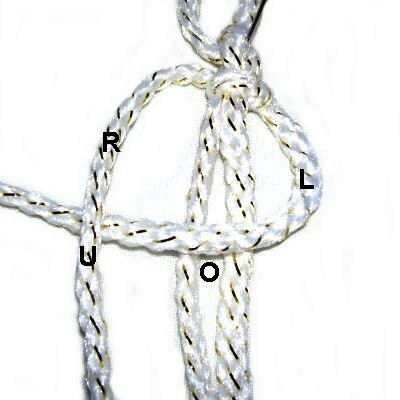 Use cords 3 and 4 from the SK on the left, and 1 and 2 from the right, to tie a new knot. Tighten it 1-inch below the first row of Square knots. See the image for step 6, which shows "alternating" more clearly. Design Tip: Making the Bell Wreath with an alternating pattern can be confusing. To help you stay organized, separate the cords into 8 separate groups, each with four cords. Double check that there are two cords coming from two different knots in row 1. 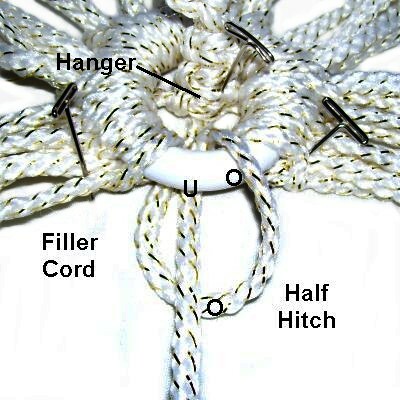 Tie a second Square Knot, using the same four cords. They can be tightened close together, or separated by 1-inch (to make picots). Slide the second knot up, while holding the filler cords. This will cause two loops to form (picots). 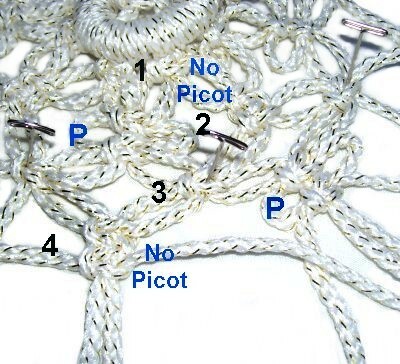 Step 5: Use the remaining cords to tie the rest of the second row, but don't put the picots next to each other. Instead, for every other group you should tie the two SK so they rest close together. Step 6: Alternate the cords again, to tie the third row. You can clearly see in this image how the cords come from two different knots in the second row. Move down 1-inch and tie the next SK. Tie only one knot for this entire row. Step 7: Repeat steps 4 - 6 to create the 4th and 5th rows of the Bell Wreath design. The groups used to make the picots need to be opposite from those in row 2. 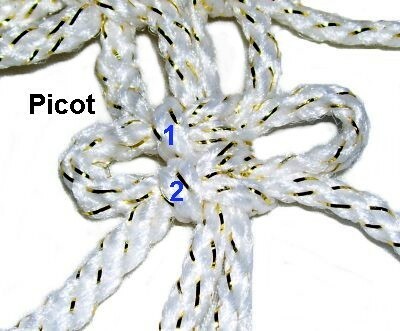 So if there is a picot design in row 2, tie the 2 knots in row 4 without them (and vice versa). 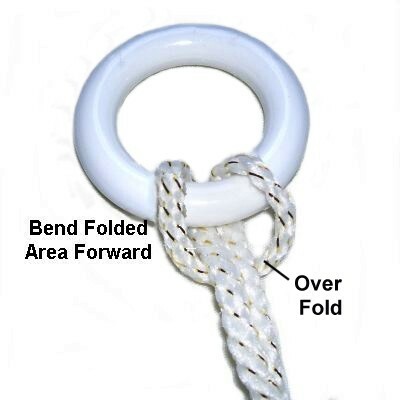 Important: The Square Knot design will begin to move upward, like a dome, as you complete step 7. Don't try to make the design flat again. 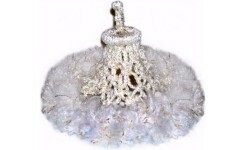 Instead, bring the knots closer together to encourage the Bell Wreath to bend upward even more. I recommend you secure the knots in one row, while tying those in the next one. This makes tightening the knots easier. Now it's time to attach the cords to the lower ring for the Bell Wreath. 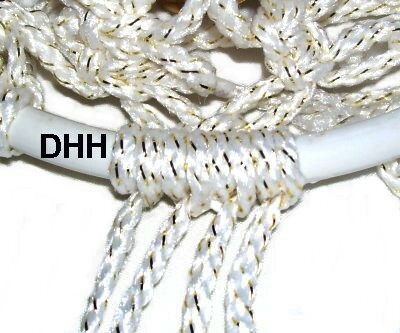 You do so with the Double Half Hitch, just as you attached the hanger to the upper ring. Step 8: Attach the small metal bell onto the hanger, which is dangling on the inside of the design you just made. Place the 7-inch ring over the top of the main area. Make sure all the cords pass under it, as you organize them into the 8 groups you finished with in step 7. 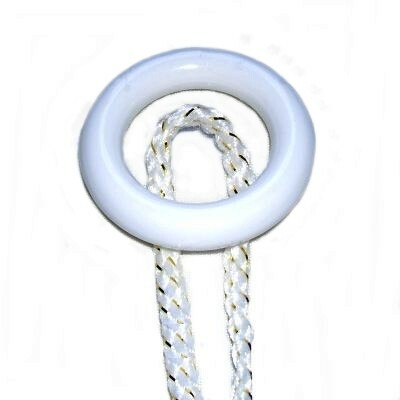 Attach each cord to the large ring with Double Half Hitches. It's best if you attach 4 cords at a time, directly under the SK tied in the last row. Tighten all these knots firmly. There will be space between each set of knots, which will be filled in later. When all the cords are attached to the ring, turn it over so you can reach inside. Apply glue to the back of all the knots, and allow it to dry before moving on. 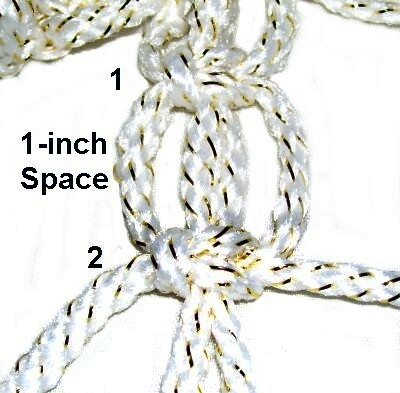 Step 9: Attach two 20-inch cords to each of the 8 spaces between the knots, with reverse Larks Head knots (same technique as in step 2). 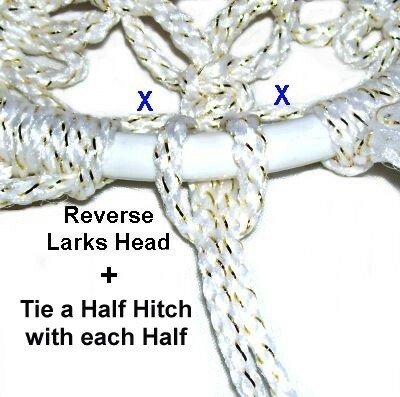 Use each end to tie 1 Half Hitch, to the left and right of the Larks Head knot. Step 9, continued: Slide two 8-inch cords through spaces around the SK resting against the inside of the ring (blue X). They don't need to be knotted, just fold them. Unravel and brush all the cords, one at a time. For the 8-inch pieces that are not attached to the ring, hold both ends as you brush. Trim the cords as needed. You can use the scraps to fill in some of the thin areas. Just slide them through spaces on the inside of the ring. This is what the Bell Wreath should look like when you are through. Have any comments about the Bell Wreath? Contact Me.